What is a Bike Hub? The Hubs will be the focal point for a broad spectrum of cycling activity, from informal support and advice to led rides, cycle training and supervised activity. All these will be on offer at the four Hubs in Selby, Doncaster, Fearnville (Leeds) and Brigg (Lincolnshire). The Community Bike Hubs follow hot in the footsteps of the Yorkshire Bank Bike Libraries, another Tour de France legacy project, whose aim it is to provide a bike for every child in Yorkshire. Since launching in 2015, over 20,000 opportunities to ride a bike have been offered by the Libraries and over 2,000 bikes donated by members of the public. Where Bike Libraries already exist, Hubs will compliment them to provide support services for adults and families who want to cycle more often. Each Hub has been chosen in the heart of local communities and will connect local people to a wide range of interests and abilities - from beginner to intermediate, young people to older, male or female or from leisure riding to cycle sport. The ambition is to establish a community bike hub in every Yorkshire Local Authority by 2017. "The ambition is to establish a community bike hub in every Yorkshire Local Authority by 2017." Selby bike hub will be a new hub operated by Inspiring healthy lifestyles in partnership with Selby District Council. The Hub is based at Selby Park in the heart of the town centre. 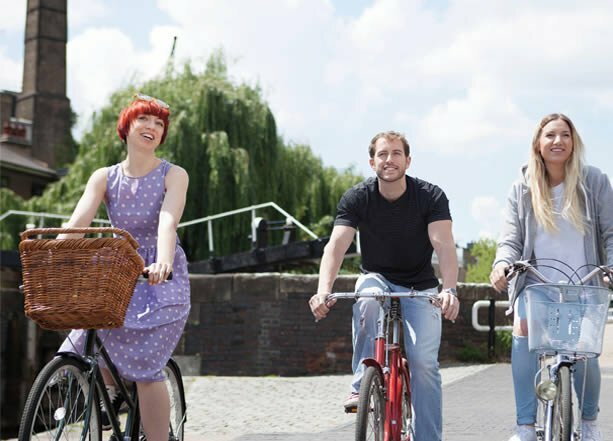 It is offering information on cycle routes, signposting to local bike library, bike loan opportunities, maintenance advice and a welcoming, sociable place to meet and talk all things cycling. This Hub is operating from the Doncaster Dome and is providing information provision on cycle events, local clubs, local cycling opportunities and led bike rides. Activities will include cycle safety sessions, weekly led rides from both the Dome and in the Dearne Valley, outreach and training for volunteers. Situated in the market town of Brigg providing cycling facilities, safe and secure place to lock bikes, public tool station, information point and workshops for local people. The Brigg Hub is centred on a cycle friendly café providing a meeting point for Breeze and Ride Social rides in a relaxed and friendly environment, to welcome the new cyclist. The Hub will also act as a central information point for all things cycling including cycling opportunities, local routes and maps, cycling groups and clubs in the area. Fearnville Bike Hub is an established centre in Leeds that also operates as a Bike Library. The team at the Hub reduces the boundaries preventing people from riding a bike and takes people on led rides, training and a range of cycle activities. Recycled bikes via the Bike Library are also available for people to borrow, and there's a wide range of activities, from training sessions, to skills, healthy rides, girl and women only sessions, mountain bike and BMX taster sessions, plus bike maintenance. New activities on offer include an after school family club, learn to ride again sessions and doctor's referrals.